Opinion: Trump's Recognition Of Golan As Part Of Israel Creates New Problems Aaron David Miller argues that the president's recognition of Israel's sovereignty over an area considered occupied territory by most states will undermine Trump's agenda. 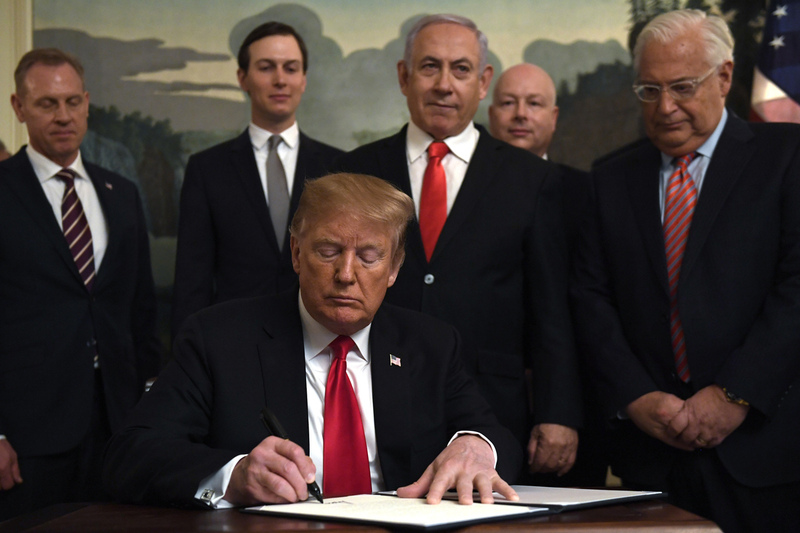 President Trump signs a proclamation at the White House on Monday officially recognizing Israel's sovereignty over the Golan Heights, with Israeli Prime Minister (center-right) among the officials looking on. Aaron David Miller (@aarondmiller2), a vice president at the Woodrow Wilson International Center for Scholars, is a former State Department official who advised six previous secretaries of state 0n Middle East policy. He is the author of The End of Greatness: Why America Can't Have (and Doesn't Want) Another Great President. If there ever was a foreign policy decision made for Donald Trump, it has to be this week's presidential proclamation recognizing Israeli sovereignty over the Golan Heights. The decision is perfectly in line with the Trumpian way: It's great politics, both for his friend Israeli Prime Minister Benjamin Netanyahu and for him, especially looking toward 2020. It appeals to the president's ego by offering him a chance to unilaterally create another historic first (see U.S. Embassy in Jerusalem) and rightly or wrongly take a ride into the history books. Israel captured the Golan Heights from Syria in 1967 and then moved to annex the area in 1981. Most nations did not recognize that move and still consider the Golan occupied territory. In recognizing Israel's sovereignty to the Golan Heights, President Trump has come up with a solution to a problem Washington never had. In doing so, he has created new problems that undermine the U.S. national interest and Trump's own foreign policy agenda, including his stated plan for a peace deal in the region. And here's why. The administration has tried to link Trump's Golan decision to the need to counter Iranian efforts to attack Israel from the Golan. But it's a thin reed that just doesn't add up. The move will hand Iran, Hezbollah and Syria more propaganda advantage and might even incentivize them to focus more attention on Golan. Far more compelling, two weeks from what is certain to be a closely fought election in Israel, is Trump's desire to give Netanyahu an edge in the race. It's not only good politics for Netanyahu — a politician with whom Trump has bonded as they both claim to face a hostile media; a liberal establishment and "deep state" conspiracies. It's also great politics for the U.S. president looking for re-election in 2020. Strong support for Israel is music to the ears of millions of evangelical Christians, conservative Republicans and a significant number, though hardly a majority, of American Jews who vote Democratic. Trump has intensified his efforts of late to establish the Republican Party as the go-to party on Israel and even to paint Democrats as "anti-Israel" and "anti-Jewish." Previous U.S. administrations have also intervened in Israeli elections to play their favorites, but nothing as blatant as this one-two punch. Little more than a week ago, Secretary of State Mike Pompeo traveled to Israel and visited the Western Wall in Jerusalem accompanied by the Israeli prime minister, a first for a top American diplomat. Trump's move on Golan had nothing to do with the national interest and everything to with his politics and his ego. Whatever pressure there was to change the status of the Golan, President Trump's move was tethered purely to his and Netanyahu's political calculations. Indeed, far from wanting to assert Israeli sovereignty, most recent administrations — largely at Israel's request — were interested in testing the possibility that Syria and Israel might be able to do a deal over the Golan. Back in 1981, Prime Minister Menachem Begin introduced legislation that eventually became basic law that extended Israeli law, jurisdiction and administration over the Golan Heights. He had been pressed by a well-organized Golan lobby and international pressures and focus to demonstrate Israel's connection to the Golan Heights. There was significant external reaction to the annexation, including a critical United Nations Security Council Resolution and the Reagan administration's suspending a Memorandum of Understanding on Strategic Cooperation with Israel. Trump's move on Golan occurred at a time when, both inside Israel and outside, there were no pressures on the country or the Netanyahu government to change the status of the territory. In fact, it was widely assumed that, because of the chaos created by the Syrian civil war and the pariah status of Syrian President Bashar Assad and his regime, any negotiations or status change regarding the Golan Heights were far-fetched and irrelevant. Perhaps the administration didn't think through the implications of the Golan move, or didn't care. But U.S. recognition of sovereignty set a damaging precedent both in the Middle East and outside. Unlike recognition of Jerusalem or opening a U.S. Embassy there, which had figured prominently in Republican and Democratic campaign commitments, there were no long-standing pressures to recognize Israeli sovereignty over the Golan. Netanyahu had raised this issue off and on, and recently there had been legislation by Republican lawmakers, but those were hardly significant pressure points. Perhaps the administration didn't think through the implications of the Golan move, or didn't care. But U.S. recognition of sovereignty set a damaging precedent both in the Middle East and outside. It hardly matters if the administration believed that it was simply recognizing reality and that there were no prospects for any negotiation over the Golan or peace treaty with Syria. The administration's action created a new reality. First, it undermined not only U.N. resolutions critical to the Arab-Israeli conflict but the U.N. Charter itself, including the principles of peaceful resolution of disputes and the unacceptability of the acquisition of territory by force. Validating Israel's sovereignty over Golan sent a powerful signal to authoritarian leaders everywhere that what they've done (see Russia in Crimea and Ukraine) or what they might do in the future would somehow be acceptable and go unchallenged. There are major differences between territory Israel acquired after being attacked by Syria in 1967 and Russian aggression in Crimea. But the ultimate status of the Golan Heights — as many Israeli leaders including Netanyahu have acknowledged through their own peace efforts with Syria — might have been resolved through negotiations. Israel was in fact prepared for full withdrawal from the Golan even after it annexed the area in 1981. It is doubtful, particularly after the Syrian civil war, the Iranian threat, growing support among the public for keeping the Heights and Trump's recognition of sovereignty, Israel would be prepared to do so again. The Golan move will also directly undercut the president's own commitment to broker the so-called ultimate deal between Israel and the Palestinians. The Arab states — even the Saudis — have rejected the move publicly. And if Trump was expecting their cooperation in either reaching out to Israel or pressuring the Palestinians, that's going to be much harder now. Palestinians who have already been hammered by the Trump administration — the Palestine Liberation Organization's office in Washington was closed, U.S. assistance to Palestinians was cut — will rightly conclude that Trump has opened the door to Israeli efforts to annex part of the West Bank. Indeed, the prime minister asserted on returning to Israel that Trump's decision proved that you can keep occupied territory as long as it was acquired in a defensive war. A new Haaretz poll suggests 42 percent of Israelis favor some form of annexation of the West Bank. If Netanyahu wins the next election and his option is a right-wing government, the trend lines in favor of annexing part of the West Bank may intensify. Indeed, the Trump ultimate deal initiative reportedly to be announced after Israel's April 9 elections was already facing long odds of success. The president's Golan decision may well ensure that the door to his Israeli-Palestinian peace plan remains closed for the season.